I roll to a stop at a traffic light on Lake Street. While I wait, my mind flits a thousand miles away to things that don’t matter—and won’t matter—even tomorrow. On my left, a woman, holding a sign, stands on the sun-soaked median. The driver of the car in front of me lowers his window and extends a hand to her. A tattoo sleeve decorates his arm; man-made beauty sprawled on God’s skin. And I smile at the gift he gives her too. Maybe it’s just a few coins, but a grin explodes her features, blasting away the darkness around her. At once, gratefulness and regret needle me. I’m happy I don’t wear monochromatic lenses; the Asian woman squeezes the black man’s hand, and I get to watch the scene in color. But I’m disappointed I didn’t capture the fragile exchange on camera to keep as a reminder for the days when I forget. She hauls a cardboard box across the alley to my house and unloads its contents onto my dining room table. Delighted, I clap at the sight of it all. She knows me well. 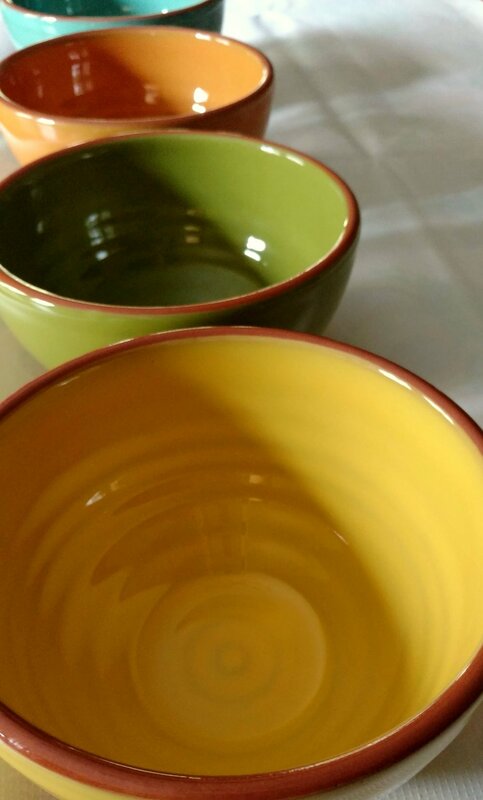 A collection of ceramic bowls. Pretty, like her, and in different colors—like the two of us. I feel that familiar pain in my chest that only gets better when I hug her. The stoplight and the dining room table. The wide range of beauty I see humbles me, and it doesn’t end here. Even heaven needs different colors to be perfect.